State Rep. David Welter (R-Morris) and his family attended the Veterans Day ceremony in Coal City on Saturday. 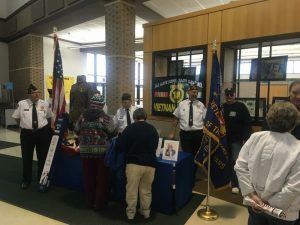 Rep. Welter spoke at the event and expressed his deep appreciation to the men and women who have served in the U.S. Armed Forces. The event also featured a military timeline of volunteers dressed in uniforms and carrying items representing each war and conflict in which United States servicemen and women have fought, from the Revolutionary War, Civil War, the Spanish American War, World Wars I and II, the Korean and Vietnam Wars and Desert Shield and Desert Storm.